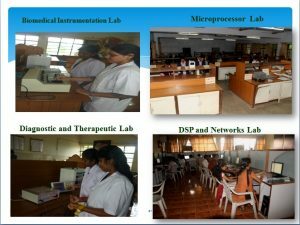 Department of Biomedical Engineering (with an intake of 60 students) was established in the year 2006 in St. Peter’s Engineering College, which was declared as Deemed-to-be-University in the year 2008. The department has produced several university rankings including University seventh rank in the year 2010. To promote higher education, a Post graduate Programme – i.e., M.E in Biomedical Engineering was started in the year 2011. Biomedical Engineering (BME) is the application of engineering principles and techniques to the medical field. 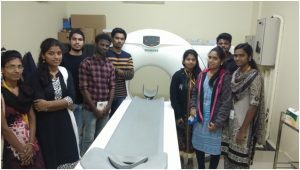 It combines the design and problem solving skills of engineering with medical and biological sciences to improve diagnosis and treatment in healthcare industry. Department of Biomedical Engineering at St. Peter’s Institute of Higher Education and Research prepares the students for wide careers in this emerging field. Students have obtained placements at leading hospitals. Many are pursuing their higher studies in prestigious institutions in India and abroad. Much of the work in biomedical engineering consists of research and development, spanning a broad array of subfields. They play a prominent role in the management of resources in hospitals. Prominent biomedical engineering applications include the development of biocompatible materials, prosthetics, various diagnostic and therapeutic medical devices ranging from clinical equipment to micro-implants, common imaging equipments such as MRIs and EEGs, biotechnologies such as regenerative tissue growth, and pharmaceutical drugs & biopharmaceuticals. have an ability to apply knowledge of mathematics, science and engineering to the solution of complex engineering problems – Engineering Knowledge. have an ability to identify, formulate and analyze complex problems in the field of biomedical engineering using principles of mathematics, natural, biological and engineering sciences – Problem Analysis. have an ability to design components, systems, or processes to meet the specified needs within realistic constraints of economic, health and safety, cultural, societal, ethical and environmental considerations – Design/development of solutions. have an ability to use research-based knowledge and research methods including design of experiments, analysis and interpretation of data, and synthesis of the information to provide valid conclusions – Conduct investigations of complex problems. have an ability to use the techniques, skills, and modern engineering tools necessary for biomedical engineering practice – Modern tool usage. have an ability to apply reasoning informed by the contextual knowledge to assess societal, health, safety, legal and cultural issues and the consequent responsibilities relevant to the biomedical engineering practice – The engineer and society. have an ability to understand the impact of the biomedical engineering solutions in societal and environmental contexts, and demonstrate the knowledge of, and need for sustainable development – Environment and sustainability. have an ability to apply ethical principles and commit to professional ethics, responsibilities and norms of the engineering practice – Ethics. have an ability to function effectively as an individual, and as a member or leader in diverse teams, and in multidisciplinary settings – Individual and team work. have an ability to communicate effectively on complex engineering activities with the engineering community and with society at large, such as, being able to comprehend and write effective reports and design documentation, make effective presentations, and give and receive clear instructions – Communication. have an ability to demonstrate knowledge and understanding of the engineering and management principles and apply these to one’s own work, as a member and leader in a team, to manage projects and in multidisciplinary environments – Project management and finance. have an ability to recognize the need for, and prepare to engage in independent and life-long learning in the broadest context of technological change and contemporary issues – Life-long learning. The graduates of Biomedical Engineering will have an ability to develop and improve information system in healthcare for automated and remote access. Department of Biomedical Engineering is recognized as a world leader in preparing students for careers in industry and business and for graduate education in engineering, medicine, and science. Biomedical engineering, or bioengineering, is the application of engineering principles to the fields of biology and health care. Biomedical engineers work with doctors, therapists and researchers to develop systems, equipment and devices in order to solve clinical problems. Biomedical engineering utilizes knowledge from traditional engineering disciplines to solve problems in living systems. The undergraduate program contains a set of “core knowledge,” defined and taught by the faculty, that future biomedical engineers should possess. Our students were exposed to various trainings in hospitals and companies. Various programmes like seminars, workshops were organized by the department to inculcate research in the young minds. Students were encouraged by giving seed money for the best ideas do their project. Biomedical engineering is the application of principles and problem-solving techniques of engineering to biology and medicine. This is evident throughout healthcare, from diagnosis and analysis to treatment and recovery, and has entered the public conscience though the proliferation of implantable medical devices, such as pacemakers and artificial hips. Biomedical engineering focuses on the advances that improve human health and health care at all levels. Biomedical engineering differs from other engineering disciplines that have an influence on human health in that biomedical engineers use and apply an intimate knowledge of modern biological principles in their engineering design process. There are many sub disciplines within biomedical engineering, including the design and development of active and passive medical devices, orthopaedic implants, medical imaging, biomedical signal processing, tissue and stem cell engineering, and clinical engineering. MOU has been signed with Indian Medical Association on 30thAugust 2013 for training of students and faculties in newer medical equipments. 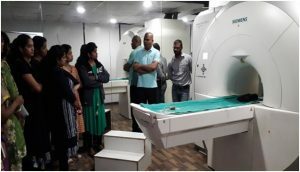 MOU has been signed with SIEMENS Healthcare Private Ltd. on 6thJuly 2018 for training of students and faculties in (i) bio-medical instruments – i.e., X-ray machines, magnetic resonance imaging (MRI), computed tomography (CT), and ultra-sonography, (ii) lab diagnostics, (iii) biochemistry techniques, (iv) immunology, (v) hematology, (vi) point of CARE devices to specialities like nephelometry, enzyme-linked immunosorbent assay (ELISA), high performance liquid chromatographic (HPLC) testing, and radioimmunoassay (RIA). The Department of Biomedical Engineering has organized the following Workshops. The department of Biomedical engineering conducted the hands-on training workshop titled “Biomedical Circuits and Systems interfacing” on 25th of Feb 2017. The workshop was organized by the department of Biomedical engineering, SPIHER and it was sponsored by MSME, New Delhi. The inaugural address was given by Dr.D.S.Ramachandhramurthy, Bursar R& D, SPIHER, Avadi, Chennai. The guest of honor was Mr.K.P.Arivazhagan, Director, Visa Infotech, Chennai. The keynote address was delivered by Mr.K.Prabhakaran, Project Head, Visa Infotech, Chennai. Workshop on different areas such as IOT, embedded systems and biomedical system interfacing have been demonstrated which gave the students to learn and understand new things which they didn’t come through in their regular subjects. The workshop was divided into two sessions. In the morning session guest lecture was given by the speakers about by biomedical circuits and system interfacing. In the afternoon session circuit kit were provided to each and every students and they were trained on hardware assembly and programming. The certificates were issued to the participants. The Department of Biomedical Engineering, had conducted a workshop titled “Industrial Automation and Embedded Systems” on 20th of September 2013. The workshop was sponsored by MSMSE, New Delhi. The inaugral address was given by Dr.K.Kantharaj, Dean & HOD-Biomedical Engineering, Avadi, Chennai. 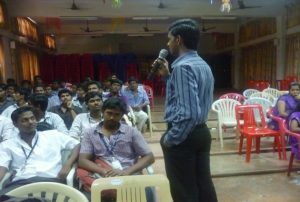 The guest of honour was Mr.M.Vinoth from Wiztech Automation Solutions Pvt Ltd, Chennai. The basics of Embedded system and the design of circuits using embedded system have been demonstrated to the students. The workshop was divided into two sections. In the morning session, lecture was given on the basics of Embedded system. In the afternoon session, design of circuits was demonstrated to the students. Finally certificates were issued to the participants. To develop Health oriented Engineering technologies and to enhance and improve the health status of the Nation. To produce academically qualified research oriented and professionally eminent Biomedical Engineers to serve the field of medicine with their Engineering skills. Career Achievements–Graduates will demonstrate their skills in solving challenges in their chosen field through the core foundation and knowledge acquired in biology, medicine and engineering. Professionalism– Graduates will display leadership, make decisions with societal and ethical responsibilities, function and communicate effectively in multidisciplinary settings. Life-long Learning– Graduates will recognize the need for sustaining and expanding their technical competence and engage in learning opportunities throughout their career and life.